Description: New NS Gevo 7533 on NS 123. Description: NS 7533 displays the "Undec" scheme on the BNSF Fort Worth Subdivision. Photo taken with Ken Fitzgerald's Canon 20D. Description: Finally painted a little after a year in service. Description: Yes, they're running with an honest to goodness NS caboose although it looks to be ex NW. Description: Spare no expense for our customers. 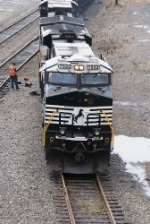 NS using 4000 hp to switch Waynesboro hoppers. You'd think they would put a GP 38 up here. 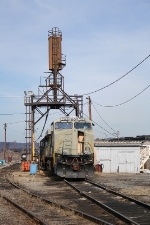 Description: Another primer unit at Roanoke Yard. Description: CAAL(39G) races through Conshohocken with a UP M, NS -9, and an NS GEVO after night showers. Description: Westbound intermodal passing M.P. 116. Description: An NS coal train is waiting for a new crew while antique Alco's work in Meadville Yard. 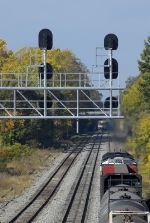 Description: NS train 349 heads for a meet with NS 350. Description: NS train 349 heads out of town, while in the distance, train 350 prepares to enter the yard. Description: 174 heads north on the Marion Branch.